Heading to Thailand for the first time? No worries. With this ultimate list of what to pack for Thailand as curated by Thai locals, you won’t miss a thing and your Thailand trip will surely be smooth as silk. And even if you’ve been to Thailand before, it doesn’t hurt to go through this checklist again. After all, we can never be too prepared. So apart from the usual travel essentials like weather-appropriate clothes (mostly hot and humid in this case), toiletries, medicine, camera and phone, here is your one-stop guide for what to pack for Thailand. Some sad truths about Thai toilets: toilet paper and soap aren't always available and toilet seat cleaner is a rarity. While you’ll find tissue paper more often than not, getting both tissue and wet wipes will be a surefire way of maintaining good hygiene. Thai street food is also a must-try. You can never know when you’ll want to stop and try something, so wet tissues will definitely come in handy. Some footpaths in Bangkok might remind you of Minesweeper. If you step on the wrong paving slab, it might wobble and splash your feet and legs with questionable water. All the more reason to have wet tissues on hand, especially in the rainy season (May to early-November). We’re sure most of you put at least one temple on your Thailand itinerary, so make sure you dress appropriately. 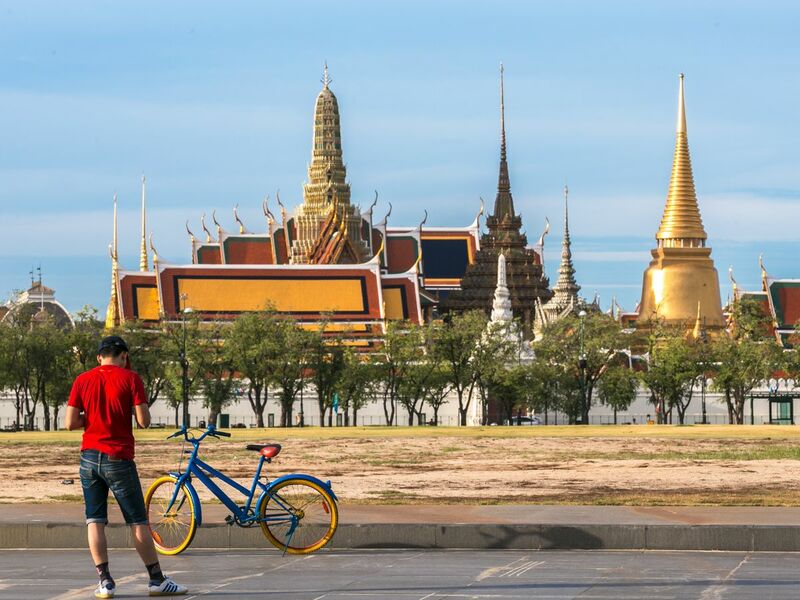 As the dress code for the Grand Palace and Wat Phra Kaew (Temple of the Emerald Buddha) goes, both men and women must wear sleeved clothes. Your shoulders, ankles, and midriff must be covered. Men are required to wear long trousers and women long trousers or long skirts. Tight pants and flip-flops aren’t allowed either. Other temples are less strict, but revealing clothes are always a no-no. Major attractions have clothes rental booth, so visitors can cover themselves up properly. Still, dress appropriately from the start, so you don’t have to waste time queuing. You’ll find signs that request you to take off your shoes in some places (like temples), so save more fancy shoes for other days. Sandals are also a great option, but if you’re traveling in the rainy season, avoid those with plastic soles as they are slippery. The sunlight is strong for sure. Put hat, sunglasses and sunscreen on your list of what to pack for Thailand. If you run out of sunscreen, the convenience store 7-Eleven is ubiquitous in Bangkok and you can buy the item for a reasonable price. You’ll still find 7-Eleven in most provinces, but consider getting it in Bangkok just in case. Get your umbrella or raincoat ready. Even in the colder seasons (November to February), there is still a chance of rain. It’s very important to stay hydrated. While you can’t drink tap water in Thailand, your accommodations might provide free drinking water. Why risk getting overpriced bottles of water at major tourist attractions? Thailand is tropical and rainy. Better be safe than sorry, especially if you are going to camp or trek. For your electronic fun, bring a 220v power adapter. Grab. Uber. What a time to be alive. With these apps, it’s easier than ever to avoid taxi scams. If you prefer to explore on foot, you’ll see how easy things are with Google Maps. It’s always great to get useful info on the go as well, like finding where your hostel is or the right BTS stop. Not to mention emergency contact, chatting with your loved ones, starting a live on social media, etc. Since you’ll find Wi-Fi only at your accommodations and some restaurants and cafés, book a tourist SIM card in advance for a hassle-free experience. 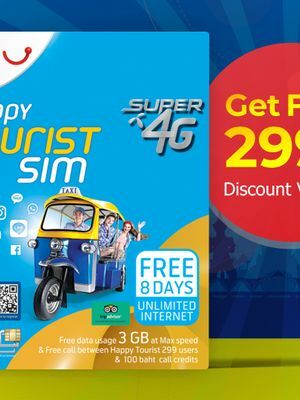 At TakeMeTour, we offer Thailand's best-selling tourist SIM cards with free 8-day unlimited 4G internet (maximum speed up to 2.5 GB) and free 100-baht call credit. Get it delivered straight to any hotel in Bangkok for only 250 baht—an exclusive price instead of the usual 299 baht! 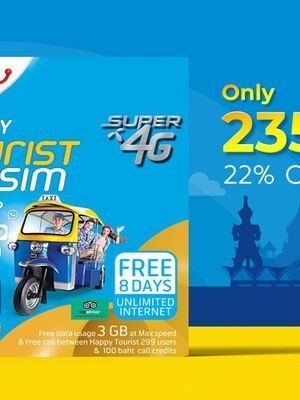 Find out 5 reasons why dtac Happy Tourist SIM Card is the best tourist SIM in Thailand, including 300 bath discount on any of our uniquely local tours. Follow the locals' guide on what to pack for Thailand and you’ll be all set for your trip. TakeMeTour and our community of Local Experts wish you safe and happy travels!